When the apocalypse comes, the knitters will be revered as gods. Their ability to churn out inexpensive, stylish knitwear will be valued beyond measure. Knitting cures radiation sickness, helps keep you warm from that pesky nuclear winter, and a chunky sweater (100% wool, of course) can keep a family of four fed for a month. As requested by the Knitpickers SnB ladies, here is my crochet fish pattern. This was an attempt to create a baby / small child toy that is reasonably unlikely to cause anyone to choke and die. Fish is worked in rounds of single crochet (double crochet in UK terminology! ), all rounds start with a ch1 and end with a sl st to join, this is to make the stripes look neat. If you aren't as obsessive as me, you can work it in a continuous spiral instead, just make sure to place a stitch marker to mark the beginning of rounds. The pattern starts at the head end of the fish and finishes at the tail end. I'm happy for you to sell Freddes made from my pattern, please just include a link to my pattern if selling online. Soooo cute :) I am disappointed about you writing you patterns in US terminology though... that's double crochet and you know it! I just wanted to thank you for the pattern. I had a request from my grandson to make him an orange fish and I used your pattern in just solid orange. 2 of the Ravelry projects are mine (TerriH), as I've started on a purple one for his sister. I'm kind of a beginner to crochet, but I know the basic terms. I was just wondering what you meant at the start of the tails when you say "pick up"
Rather than making the tail and the fins seperately and sewing them on (I hate seaming!) I picked up stitches from the side of the fish by inserting the hook under a sc on the side of the fish, pulling through a loop, ch1 and sc in same stitch, and then carrying on scing into the stitches on the side of the fish. If you're struggling, you could always start the tail/fins by chaining 10 (or whatever the number is at the beginning of the section) and then sewing them on at the end. I was hoping to make a HUGE fish (approx 20 inches/50 cm diameter--but doesn't need to be exact). Do you have any tips for scaling up this pattern? Perhaps continuing this pattern (and the same for the dec side) until I am the proper diameter? Or would this inc/dec too slowly, making the fish too long and not adorably round? Thanks so much for any help you can give me!! 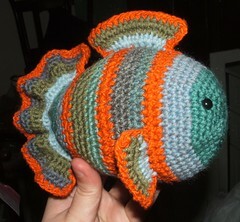 I made this for my son, I had some weird yarn and well he loved the colors, well the fish was prefect!!! I will post a pic when done. I wanna Thank You cause I was sick of the teddys and the other animals, and a lot of other fishy friends are not big enough for a 5 month old! He loves it and I am so happy you posted this really! Ooh this is wonderful! I'm going to make it for my swap partner in the Tim Burton/Big Fish Odd Ducks swap. Thanks for the pattern!! Jasmine - sorry for the late reply! I forgot about this comment. thanks so much for this pattern! I took it and modified it a bit and made a version of my son's favorite stuffed animal for him. This pattern looks great! I've never crocheted before and am planning to use this as my first project. I have a question about the terminology, though. Can you write out in plain English what something like "*3 sc, inc* means? 3sc in every stitch? Also, what's *sc, inc*? Round 3: sc, inc, sc, inc, sc, inc, sc, inc, sc, inc, sc, inc. Round 4: sc, sc, inc, sc, sc, inc, sc, sc, inc, sc, sc, inc, sc, sc, inc, sc, sc, inc. There are amigurumi patterns out there with more explaining than this one. Though if you know how to single crochet, increase and decrease you should be fine. You are very welcome to sell Freddes for charity :) Have just looked up what a Moon Bear is - cute! Hi, I have a customer wanting me to make a fish for them. She picked this one. =) Would it be okay if I make it & sell it to her? I could post this site to my Facebook page Brandy Renee Crochet to give you credit for it?! Brandy - can you email me at shinyfeline@gmail.com or leave me an address where I can get in touch with you? Your choice of colors makes this one of the most beautiful finished fish patterns I've ever seen (and I've looked at lots of them). Your pattern is wonderful too! :-) I'm starting this beauty tonight. Thank you so much for sharing your creations. I've made this fish about 10 times now...first for my two little girls and then for friends and family...I've scaled up and scaled down the pattern and people are just amazed with how cute it looks! Thanks so much for sharing it! I crocheted a "hyperbolic plane" (http://www.ravelry.com/patterns/library/hyperbolic-plane) for a friend as a gift and needed something to go along with it and made a smaller version of your fishie. I LOVE it! I've been making hats and am starting to make toys to help supplement our income as a stay-at-home mom. I would love to be able to use this pattern to sell. Check out my website (though it's a bit out of date) at littleknots.com. How big is this fish? Is there a way for me to make it about 12-16 inches long? How big is this fish? Is there any way for me to make it about 12-16 inches long? Hi, I just wanted to thank you for the free pattern! Its adorable and will make a great gift for my friend's new baby! I can't tell you how great it is to find such a great pattern that does not cost me an arm and a leg! Thanks SO much!!! Hi, I just adore the fish! I haven't learned how to crochet yet, and was wondering if there was a knit version of it or if you could make one? Thanks so much! No knit version as far as I know, it's a fairly easy amigurumi though so not a bad place to start crocheting. Perfect pattern! I did it in pinks and purples for my 6 yr old daughter who loves stuffed animals and it will be a Christmas present for her. This is my first full Amigurumi and I love it, much appreciated! Thank you for this free written pattern. I just finished Freddy, he is 8" from nose to tail fin tip and 4 1/2" from bottom to top of top fin. I love how easy the pattern is and am sad to say good buy to him. 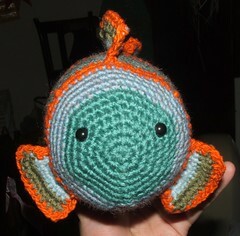 I am donating him and a few other sea animals to Mikey's Crochet-arium. I will be making more of these. Hi. I am a beginner at crocheting and this is my very first stuffed animal pattern. My sister has made stuffed animals before so she is helping me. Well, I am on step four and already we are having troubles because the circle is wicked ruffle-y. In other words, it is not a circle or a bowl, but rather a wavy thing. My sister said that it should make a kind of bowl shape, but it is not doing this. She even did some ruffles for me and her rows turned into waves instead of a perfect circle or bowl as well. We are both very confused and do not think this is supposed to happen, yet as many as 7 stitches are being made in the same single stitch, so it is bound to wave into ruffles. Is this supposed to happen? I picked this pattern because it seemed easy but is very confusing to beginners. I am disappointed. Please help. You shouldn't be making 7 stitches in the same stitch! It should indeed make a bowl shape. please could you explain the decrease rounds ie round 22 I understand 7sc but I don't understand dec around please could you explain this thankyou. The asterisks denote a repeat. 7sc, then a sc decrease over the next two stitches, then 7sc, then another decrease etc - until the end of the round.